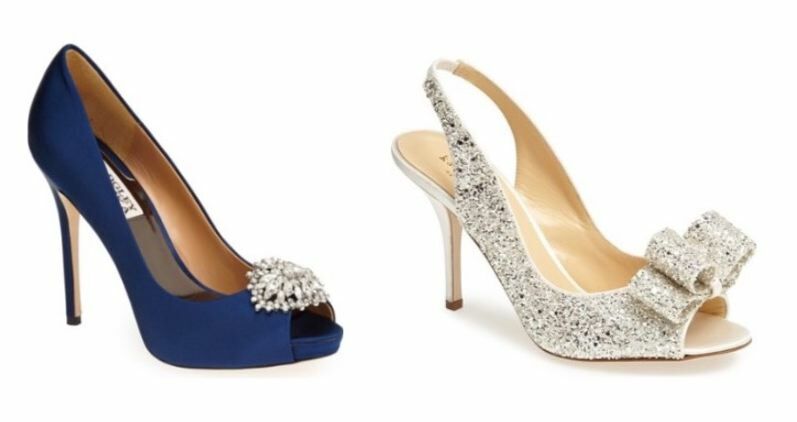 This weeks installment of wedding Wednesday is all about the shoes! When picking out your wedding shoes you should consider several factors. 1/ Where are you getting married? This will help you consider both the practicality of your shoes as well as the formality. For example, if you're getting married on the beach in Bermuda, it may be tough to walk down the aisle in stilettos. You may forgo shoes all together in this situation. Similarly, outdoor weddings that involve walking on grass might lead you to choose a wedge or a flat depending on how formal your wedding is. Although, they do make these little gadgets that prevent your heel sinking into the ground if you just can't live without that gorgeous high heel. Our ceremony will be taking place on the lawn weather permitting. Since I am not the most graceful person in the word I have opted to go with a flat. 2/ Do they match your dress? When I saw match I don't mean are your shoes made of the same exact material. Even though your shoes may not be the center of your outfit (hello wedding dress) that day, they should compliment your dress. For example, an all lace dress might look great with a simple satin kitten heel while a ball gown might look better with a navy blue and rhinestone stiletto. I'm a little bit backwards in that I picked out my shoes before I selected my dress. I just knew what I wanted from the start, so when I saw them on sale I snatched them up immediately. When I went dress shopping I ended up liking two dresses and ended up selecting one that my shoes complimented perfectly. I don't think I would suggest this for everyone but I'll discuss dress shopping further in another post. Either of these Kate Spade or Nina wedges from Nordstrom would make walking down the aisle outside a little easier. Recently, brides have been swapping out the traditional white satin heel for a more fun shoe that showcases their personality. Are you a sneakers kind of girl? Or do you rock cowboy boots daily? 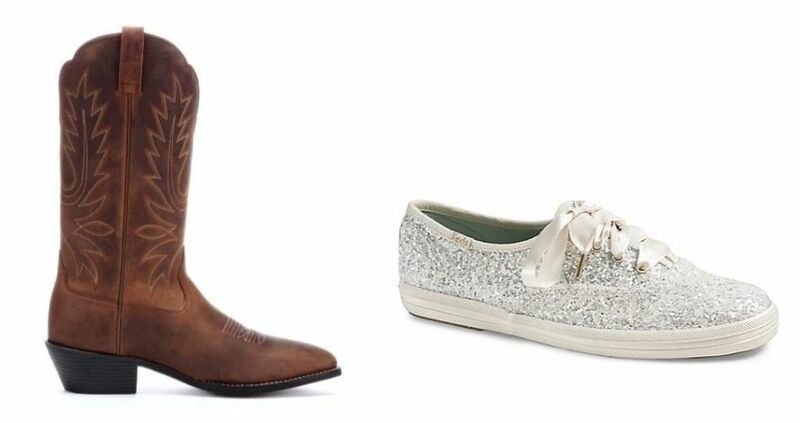 Select a pair of shoes that scream you. Bonus points if you plan to wear them again after your wedding! 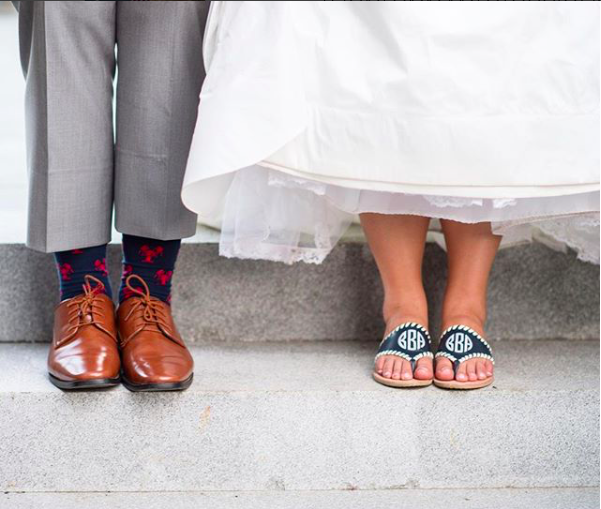 Since our wedding is in the summer, it was a pretty easy decision for me to select my shoes since I wear pretty much one type of sandal all summer long. Anyone have any guesses yet? 4/ Will you be comfortable? Weddings are long. When you're the one getting married your day is even longer. Make sure the shoes you pick are ones you could easily stand in for several hours. Remember, your dress will be perfectly altered to the height you are in your shoes. That means if you kick them off, you may be holding up your skirt with one hand while you dance the night away. This might have been the biggest factor in why I selected Jack Rogers as my wedding shoe. I own maybe 10 pairs and believe me they have experienced a lot of walking and standing. I know they will be comfortable the day of the wedding. 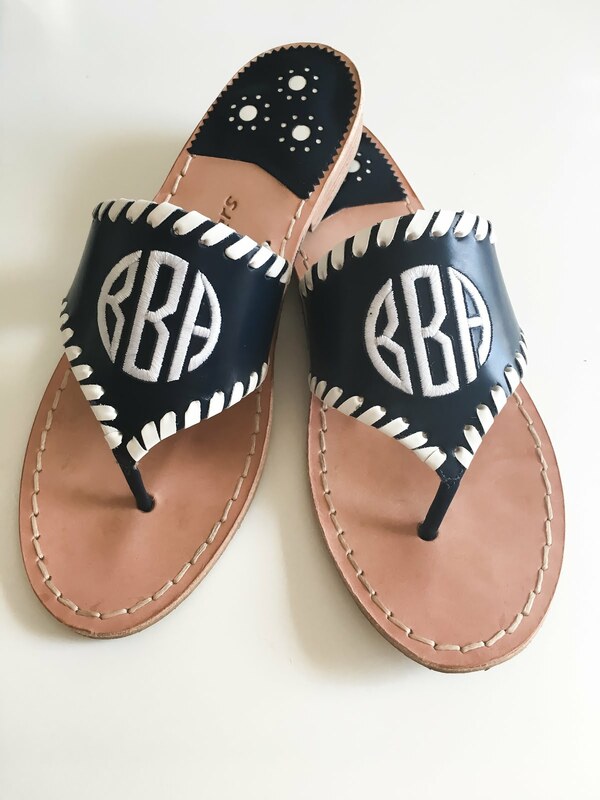 Plus, they are monogrammed with my new initials! I'm in love.